No one can escape the daily news updates and uncertainty surrounding Brexit. 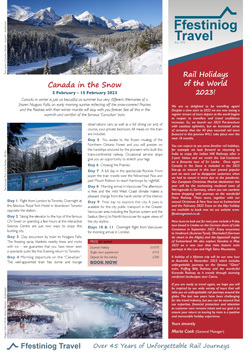 Ffestiniog Travel is here to provide up to date information when available. As a member of the Association of Independent Tour Operators (AITO) we are able to share information prepared by ABTA, which will hopefully alleviate concerns. The political process is still ongoing, and we don't yet know the final outcome. However, there have been some reassurances recently around flights and visas, please see below. It is important that we emphasise that all of the tours featured in the Ffestiniog Travel 2019 brochure have a price guarantee and no surcharges will be applied. British nationals shouldn’t need a visa to travel to the EU after Brexit. The European Commission announced in November 2018 that, even in a no-deal scenario, UK travellers can still visit the EU without a visa, providing the same is offered to European citizens visiting the UK. The European Commission has said that from 2021, UK citizens will need to pay a fee (of around 7 Euros) for this visa exemption. This is part of a new electronic travel authorisation system applying to all third country visitors to the EU, similar to the US ESTA regime. What if I book to travel after 29 March 2019 and my holiday cannot go ahead due to Brexit? This information only covers areas where you can take reasonable action or put plans into place now. We will provide additional, updated information on areas where the situation is still unclear once it has been clarified. It has always been advisable for holidaymakers and business travellers to make sure they have appropriate travel insurance, whether they have an EHIC card or not, as there are limitations to EHIC. As long as you have a full UK driving licence, you don’t currently need an additional licence to drive in the EU. This is likely to change in a no-deal scenario. UK travellers looking to drive in the EU on or after 29 March 2019 may need to apply for the relevant International Driving Permit. These cost £5.50 and are available directly from the AA, the RAC or the Post Office. The Government is working to extend the network of Post Offices where you can apply for an International Driving Permit and has plans to roll these out in more branches across the UK from 1 February 2019.